Seccies / Burgers sadly lose to the top team. Last Sunday was the first away game for the Seccies, in which they immediately faced the top team of the league: RC Drachten 1. Before gathering behind CS, the forwards gathered at the Burger King for a proper breakfast, which quickly showed its effect in the match: the seccies came away with wins from all own scrums and contested many from Drachten! 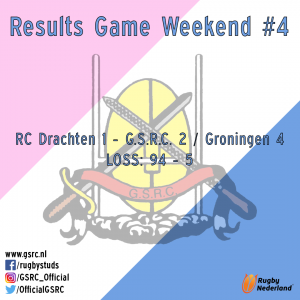 In what proved to be a tough match, Drachten took advantage of small mistakes on the Seccies’ side, resulting in many tries for the Frysian side, who’s conversion kicker only missed two attempts. However, the Seccies played one of their best games of the season so far, resulting in a try for the Burgers’ Chris, making a fantastic run through the Drachter defense. Sadly, many players came out injured, we hope to see them back soon!